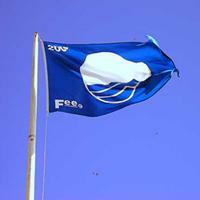 A Blue Flag is an award given to beaches and marinas that have met a series of strict environmental and safety standards. The award is given annually by the European Foundation for Environmental Education. This distinguished award has been given to more then thirty countries throughout Europe, South Africa, New Zealand, Canada, and the Caribbean. The Blue Flag criteria demands adherence to stringent environmental-safety standards, such as the presence of lifeguards and rescue teams. This ranking shows how many blue flags beaches are in each province of Spain.